A half million dollars in drug proceeds, guarded by three men with automatic weapons. For Wallace Stroby's determined heroine, professional thief Crissa Stone, and her team, stealing it was the easy part. But when the split goes awry in a blaze of gunfire, Crissa finds herself on the run with a duffel bag of stolen cash, bound by a promise to deliver part of the take to the needy family of one of her slain partners. In pursuit are the drug kingpin's lethal lieutenants and a former Detroit cop with his own deadly agenda. They think the money's there for the taking, for whoever finds her first. But Crissa doesn't plan to give it up without a fight, even as her mission of mercy puts her and a young child in mortal danger, with forces on both sides of the law closing in. After all, a debt is a debt even if it has to be paid in blood. With "Shoot the Woman First," Wallace Stroby delivers another powerful, lyrical novel, his third featuring one of the most original female characters in hardboiled fiction. WALLACE STROBY is an award-winning journalist and a former editor at The Star-Ledger in Newark, New Jersey. 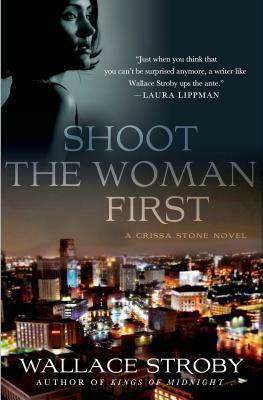 Shoot the Woman First is his sixth novel, following the acclaimed Kings of Midnight. He lives in New Jersey. The Crissa Stone novels are in development for a TV series by Showtime.